Shaved asparagus salad is the best way to enjoy our local asparagus paired with sweet ricotta, a few toasted almonds and a burst of herbs in the vinaigrette. The flavor is superior and one of the first spring green vegetables we can enjoy after a winter of root vegetables. If you don’t have lemon olive oil just use extra virgin olive oil and add the finely grated zest of 1/2 a lemon. 1. Make the vinaigrette. Combine the lemon zest, lemon juice, vinegar, shallot, 1/8 teaspoon salt and several grounds of freshly ground black pepper in a small bowl. Let sit for 5 minutes. Mix the fresh chopped herbs together in a small bowl. Add 3/4th's of the herbs to the lemon juice mixture. 2. Using a vegetable peeler, thinly shave the asparagus lengthwise into strips starting at the base of the asparagus and moving to the tip. Place asparagus shavings in a large bowl. 3. Whisk the extra virgin olive oil into the lemon-vinegar mixture. Taste and season the dressing with more salt and pepper if needed. 4. Add a ¼ teaspoon of salt to the asparagus toss quickly and lightly. Add the vinaigrette, half of the sliced almonds, and a tablespoon of the Parmigiano Reggiano toss to combine. Taste again and season with salt and pepper if needed. 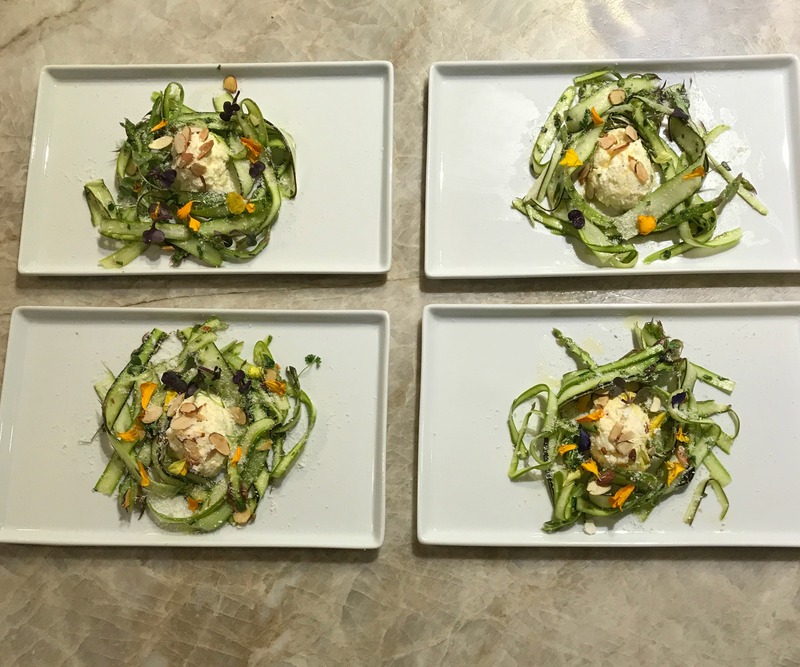 To serve place a spoonful of ricotta in the center of each plate, drizzle with the lemon olive oil and sprinkle with some almonds and remaining herbs; arrange the shaved asparagus around the ricotta and then more Parmigiano Reggiano and then the edible flowers (optional). *Lightly toast by placing in a 325 oven for 4 minutes.